How Do Cashless ATM SCRIP Machines Work? If you have any questions that are not addressed here, please contact us. 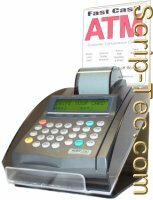 Cashless Atm Scrip machines are very simple to use. Our machines are designed to be customer activated so transactions can be run by customers before they get into line to purchase the goods and/or services that the merchant offers. This helps speed up checkout times for the merchant. steps are completed, the customer hits the enter button to send the transaction to the processor. which prints a two part receipt...one for the customer to keep for their records, and one that the customer will turn in to the merchant to redeem for cash, goods and/or services, or a combination of both at the merchant's cash register. Funds are electronically deposited into the merchant's account in 3 business days, not including weekends. The turn-around time for merchants getting their funds is the same as if the merchant were using a regular credit card machine. Everytime a customer uses the cashless atm and the merchant honors the scrip receipt, the merchant has just made a bank deposit! This helps merchants manage their cash by cutting down on the frequent need to make bank deposits or safe drops. A big plus about the program is that it provides customers the opportunity to obtain pocket cash while shopping at the merchant's establishment. If a merchant doesn't want to pay out large amounts of cash at a time, they can limit the dollar amount that customers can run transactions for. This provides an element of control for the merchant, which they will appreciate. Most busy retail locations take in alot of cash, so giving out money to customers who use the cashless atm works well for most merchants. Our machines are DES-3 encrypted in compliance with banking industry security regulations to protect the card and PIN numbers of the customers using the machines. All funds are FDIC insured and are handled by the Federal Reserve through direct deposit to the merchant's account. The merchant's portion of the surcharge that they receive for each transaction is electronically deposited by the 15th of every month, for each previous month's transactions. Merchants will also get a statement by mail to help them reconcile their bank accounts. The best way for merchants to make sure their accounts are credited the money paid out is to keep track of the daily dollar amounts on a monthly basis. This simplifies accounting for the merchant, who also has the ability to run a daily batch report right from the machine at the end of each business day. Contact us TODAY, for a hassle free consultation and find out how to get started with your own successful Cashless Atm program!